The catastrophic earthquake of 7.9 magnitude and the powerful aftershocks that hit Nepal last Saturday and Sunday took the lives of more than 6,000 people — and the death toll continues to rise. The devastation that affected a quarter of the Himalayan nation’s population has caused unprecedented loss of life, physical property and heritage sites. Since the disaster, foreign governments and international aid agencies have been scrambling to help those in distress. The suffering has drawn the attention of the whole world and the results can be witnessed in that the only airport connecting the country with the rest of the world is now congested with relief materials and rescue aircraft. 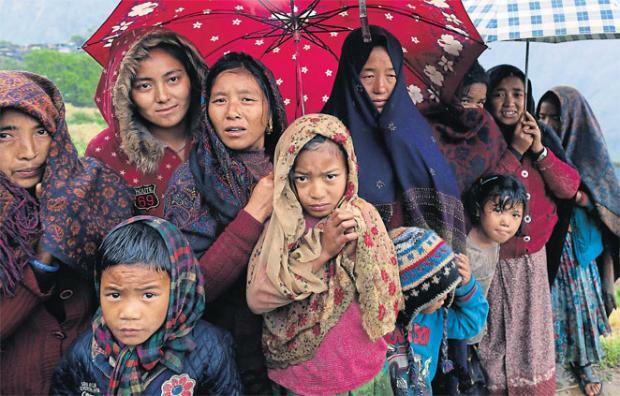 Foreign aid has been trickling in to Nepal in a largely instinctive manner. The total commitment of foreign aid has already crossed US$50 million (1.6 billion baht). Aid has been flown in from all over the world. The United Nations has allocated US$15 million from its emergency fund, and the Asian Development Bank also announced an initial release of US$3 million. In addition, the US government has announced US$9 million, making a total of US$10 million including US Aid. Among other donor nations are the United Kingdom with US$7.6 million, Australia with US$3.9 million, China with US$3.3 million, Thailand with US$3.13 million (excluding the contributions from the Thai Royal Family), the European Union with US$3 million and Bhutan with $1 million. Furthermore, spontaneous fundraising events and organisations willing to support the ailing nation have emerged around the world. Thailand is no exception. Fundraising campaigns have swept the entire Thai nation. The initiatives range from individuals to organisational campaigns. Almost all the leading media outlets as well as humanitarian organisations have set up relief funds and have appealed to the general public to contribute. Undoubtedly the intentions of the majority of relief agencies, governments and kind donors are good. Nonetheless, the presence of criminals trying to take advantage of the anguish cannot be denied. In a scenario like this, the philanthropist has a very crucial role to play to ensure the effectiveness of funds through a proper channel. It is the donor’s responsibility to make sure that hard-earned money does not fall into scoundrels’ hands. One way to avoid the criminal element is to contribute to trusted relief funds like the funds set up by government or international humanitarian agencies like Thai Unicef. We have witnessed several online donation drives going viral on the internet over the last week including scams. One piece of caution in bequeathing to these organisations is to ensure that they are registered charities and that the donations they receive are tax exempted. Otherwise, not every baht of your contribution might reach the people that need it. It needs to be understood that the real job of the donors starts when they make the decision to donate part of their income to support those in need. Deciding to donate means portraying love for the cause. If the donor’s love for the cause is genuine, it should go beyond the donation itself and the donor should check whether or not the donation is reaching the hands of the destitute. I have no intention of discouraging the kind-hearted donor. Nonetheless, in a humanitarian disaster of this magnitude, donors must be mindful of the fact that contributions might not reach the rightful beneficiaries. These concerns are founded on past experience from the Caribbean nation of Haiti. In 2010, a magnitude 7.0 earthquake struck the country, causing the deaths of an estimated 230,000 people. In the aftermath, multilateral and bilateral agencies poured in billions of dollars in relief and recovery efforts to alleviate the pain of the country. Five years down the line, some 85,000 people still reside in awful conditions in crude displacement camps leaving major questions about how the aid money was channeled and utilised. In a quest to answer this question, American author Jonathan M Katz in his book The Big Truck That Went By; How the World Came to Save Haiti and Left Behind a Disaster implicates mismatched and mismanaged interests among a complex array of stakeholders: foreign governments, non-governmental organisations (NGOs), business groups and public personas. He blames the vested interests of each actor as contributing to the ineffectiveness of aid and blames them for the stalled aid delivery. Crucially for Thai donors, Katz also sees a problem in the “noble and narrow mandate” of the private donations which were larger than the foreign aid. The private donations stressed humanitarian aid but not development assistance, causing projects to repair infrastructure and restore normality to become victims of what Katz calls “diminishing returns”. It is the nature of the news and of social media to quickly flitter from one story to the next. Therefore, private donors, foreign governments, aid agencies, NGOs and business groups need to be mindful of what we have learnt from Haiti and undertake not to repeat this failure of commitment anywhere in the world. Nepal is in dire need of resources to restore normal modes of human existence. The Nepalese government and the country will not be able to bear the cost of recovery alone. This beautiful Himalayan kingdom does not just need short-term support but requires a long-term partnership to heal the lives and restore the physical property – chiefly the 600,000 homes of the poor as well as the lost cultural heritage such as ancient temples. Development in the aftermath of disaster is not an easy task. The UN appeal itself calls for a total of US$450 million, and Nepali government sources estimate US$2 billion will be required to rebuild the country. However, if the stakeholders work closely and forego vested interests, the task, while difficult, will not be unnecessarily complex. We have seen Asian giants like Japan and Thailand recover from disasters and Nepal and its people will, after a sustained period of hardship and convalescence, no doubt be revitalised. The article originally appeared in the Opinion section of The Bangkok Post on May 04, 2015. The recent amendment in the 1980 TU regulation on Organization and Educational Administration regarding the age of candidacy on Free Student Union (FSU) election has initiated a fresh discussion on the age of youth politicians. The Supreme Court (SC) order has further provided legitimacy to the amendment made by TU. At the aftermath of the amendment, the 2015 FSU elections will see only candidates aged below 28 competing for the elections. The recent amendments have been widely acclaimed by students, academia, society, and some student unions. The age bar levied thus will end the deeply rooted culture of old leaders competing in FSU elections. The average fresher at a college is 18, while the leaders of FSUs are generally a couple decades older than these freshers. The huge age gap not only creates frustration among students, but to some extent contributes to the failure of the leaders to address students’ issues properly. The age bar will hopefully end the culture of student leaders looking for political shortcuts through FSUs. It is not only the FSU that requires an age bar. Age bar is also much needed in the youth social sector. The count of umbrella organizations of non-political Youth organizations has reached three. The Association of Youth organization of Nepal (AYON) has listed more than 90 registered member youth organizations in its website, while the website of Youth NGO Federation Nepal claims that it has united more than 2,000 youth-led organizations of Nepal. Apart from that, several other unaffiliated youth-led organizations and youth clubs exist in Nepal. The promising number of youth led organizations becomes a matter of concern when it comes to the age of the leaders of these organizations. Over the last couple of years, youth-led organizations have criticized the leaders of political youth organizations, calling them undemocratic and age-insensitive. To some extent, the blame for the situation goes to the country’s National Youth Policy, which is almost nonfunctional. The national youth policy defines 16-40 as the age of youth. This naïvely paves the way for the presence of older leadership at political as well as social youth organizations. The guiding document itself is not free from controversy, and lacks serious workout towards its implementation. Youth-led social organizations should also practice intra-organizational democracy, and create enough space and mechanism for the younger generation to lead. There are youth organizations which are led by individuals rather than by a team of young people. The faces of the leaderships have not changed for several years. Rather than creating space and opportunity for young people, several youth-led organizations have been heavily dominated by a handful of older people. Until and unless the leadership is handed over from a handful people to fresh talents, youth-led social organizations will not be able to make remarkable or sustainable impacts on society, and do not hold the moral authority to condemn political parties. The change should start from within. Furthermore, youth-led social organizations are heavily dependent on donor agencies, and leadership tends not to change due to heavy budgeted projects and long project durations. A change in the leadership at youth-led NGOs is required for them to be able to raise burning social issues related to youth. Issues faced by a 25-year-old female can be better raised by a 25-year-old female than a 35-year-old male. Besides, the issues that were relevant ten years ago may not be of concern now, and this change in priorities can only be mainstreamed when youth organizations are led by fresh leaders. There are models of youth-led social organizations like Rotary Club and Leo Club where the leadership transfers every year, providing leadership practice to several young people. However, the trend is not carried over in other youth-led NGOs of Nepal. Asking all the youth led NGOs to follow the same model will again be impractical, considering the nature of activities that they carry out. However, youth led NGOs can certainly practice a model where the leadership changes every 2-3 years. Both bottom-up and top-to-bottom approaches must be adopted to address the issue of leadership stagnancy in youth-led social organizations. These organizations need to adopt a clear democratic process in practice rather than in paper to promote leadership transformation. To aid that, the national youth policy must be updated to meet the changed expectations of young people, and the age bar for a person to be considered “youth” must be reduced to 30.